I can not tell a lie: I've never eaten KFC. Despite that, watching this commercial made me consider a little late night stop, and not just because my roommates were enthusiastically discussing the merits of KFC by the ad's end. So, why is this ad worth watching? A recent report by Cohn & Wolfe revealed that consumers rate "honesty and transparency" alongside price and quality when considering wether to buy a product or brand. This is a direct backlash from decades of corporate dishonesty and misrepresentation. This ad doesn't claim that KFC is healthy or try to make the assertion that it's the best food out there. Instead they focus on the actual value of the product, which is the low price in relation to the amount of food purchased. In other words, they're being honest about what they offer customers. 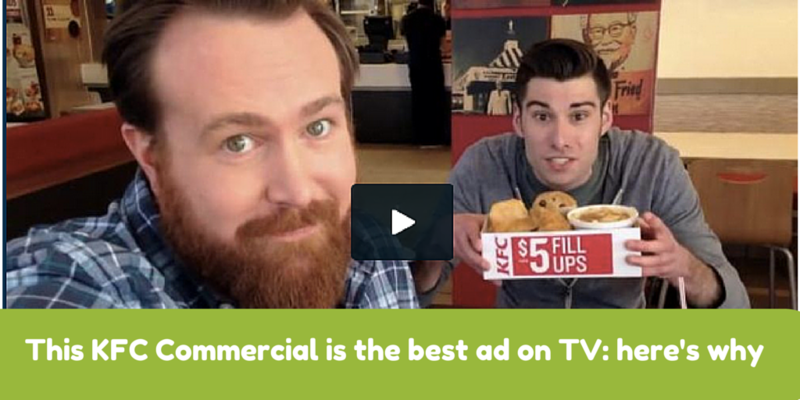 Have you ever seen a commercial and wondered, "who exactly are they trying to appeal to?" because I have. It's the result of a company being disconnected from it's core audience or being unrealistic about their customer acquisition strategy, and it nearly always annoys and alienates viewers. Everything in this ad is working in tandem to appeal to the 18-30 year old male demographic, which also happens to be the demographic of my three KFC loving roommates. They cast actors who are unique enough to be memorable, but normal enough to be relatable. They used editing techniques to make it look as though the whole thing was filmed with someone's smart phone, and the script was skillfully written to sound like a realistic conversation a guy might have about KFC with his buddies; I've heard many nearly identical conversations in my own living room. There are many things that merit serious consideration and relfection in this world, but a $5 fill up from KFC isn't one of them. Brands that over-produce "serious" commercials to promote their brands are really only advertising the fact that they're out of touch with the people they're trying to sell to. The overall tone of this commercial from the pacing to the music to the mention of $5 checks from grandma and how annoying they are to cash, is the perfect mixture of laid back and tongue in cheek. A commercial that actually converts customers is a rare occurance; it's a safer bet to let products and their content speak for themselves or risk alienating potential customers. Have you seen a great ad lately? How about one that was really terrible? Give us the 411 in the comments section below.